Gaeng Tai Pla is a legendary recipe developed by people in the fishing communities of Southern Thailand. They wanted to find a way to use the fish guts rather than toss them out, so they developed a pickling process of the fish bladder. The pickled fish bladder (Tai Pla) is used to make a special soup using a heavy dose of local spices and large chunks of dried fish meat. Lately people all over Thailand crave the Tai Pla that comes from various regions, and packed in different brands. In our Gaeng Tai Pla recipe, we show you every step in the process, sharing the preparation method of a chef from Trang in Southern Thailand. As authentic as it gets. The most important thing is the pickled fish bladder. 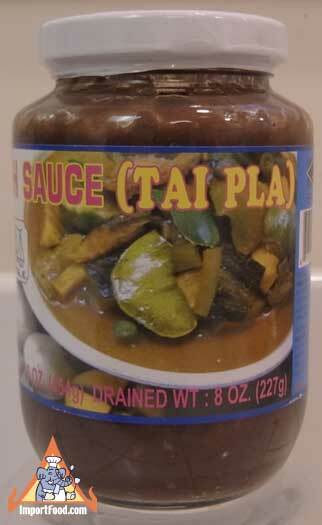 For years we've wanted to offer this high quality imported Tai Pla so you can make this at home. Packed in a glass jar, 8 oz is a nice large quantity. Ingredients: fish, salt. All natural.